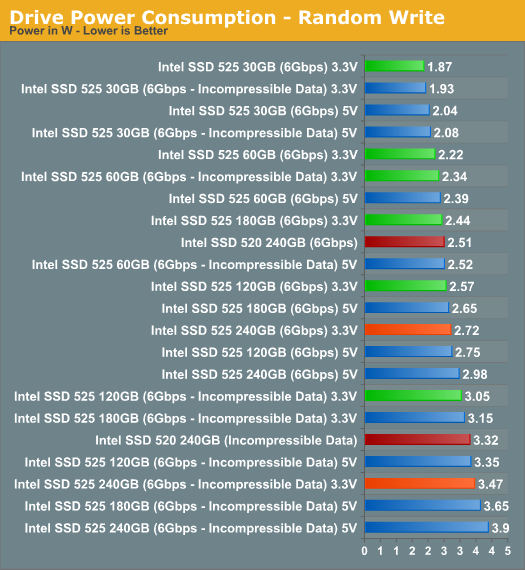 Intel's SSD 525 is the mSATA version of last year's SF-2281 based Intel SSD 520. The drive isn't just physically smaller, but it also features a new version of the Intel/SandForce firmware with a bunch of bug fixes as well as some performance and power improvements. Among the improvements is a tangible reduction in idle power consumption. However in our testing we noticed higher power consumption than the 520 under load. Intel hadn't seen this internally, so we went to work investigating why there was a discrepancy. The SATA power connector can supply power to a drive on a combination of one or more power rails: 3.3V, 5V or 12V. Almost all 2.5" desktop SSDs draw power on the 5V rail exclusively, so our power testing involves using a current meter inline with the 5V rail. The mSATA to SATA adapter we use converts 5V to 3.3V for use by the mSATA drive, however some power is lost in the process. In order to truly characterize the 525's power we had to supply 3.3V directly to the drive and measure at our power source. The modified mSATA adapter above allowed us to do just that. 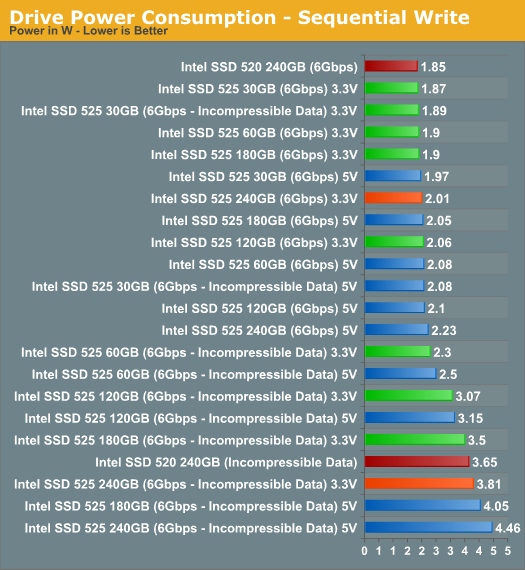 Note that the 525 still holds a tremendous advantage over the 2.5" 520 in idle power consumption. 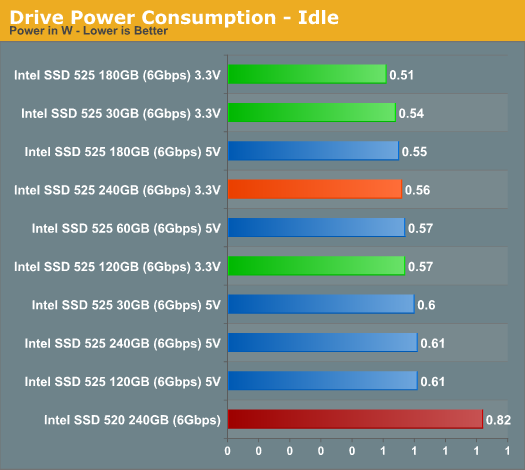 Given the Ultrabook/SFF PC/NUC target for the 525, driving idle power even lower makes sense. Our 520 still manages to be lower power than the 525, however it's entirely possible that we simply had a better yielding NAND + controller combination back then. There's about a 10 - 15% reduction in power compared to measuring the 525 at the mSATA adapter's 5V rail with the 240GB model. There story isn't any different in our random write test. Measuring power sent direct to the 525 narrows the gap between it and our old 520 sample. Our original 520 still seems to hold a small active power advantage over our 525 samples, but with only an early sample to compare to it's impossible to say if the same would be true for a newer/different drive. I've updated Bench to include the latest power results. Awesome that you fixed this measurement error (ahem.. sorry to be boasting but... I told you so :P), but you're still not quite there. Look at the datasheet. Now look at bench. See the giant difference? Uh... thanks :) but yeah, this really isn't the place. I'll update my blog very soon about MADPSU. But these race to sleep sooner and therefore use less power for the same work (see the iPhone 5 review for an overview of this concept). Any thoughts if the 240GB 525 + mSATA>2.5" adapter a better choice over a 520 or Sammy 840 for an efficient ultrabook ? With that in mind, does anyone know if: a) the adapter degrades speed (are data+control lines direct connection ? ), b) which make of adapter Anand used, c) if choice of adapter affects compatibility ?